This is absolute madness. The LA Times (among many, many others) is reporting on the newest batch of violence gripping South Africa. Apparently there has been a huge wave of anti-foreigner sentiment that started in Alexandria, a suburb/township near Johannesburg and has spread across much of Kwa-Zulu Natal and some of the Northern Areas of South Africa. 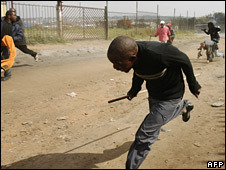 Much of the xenophobic violence is targeted at immigrants from Zimbabwe, or so it seems. For now, Western and Eastern foreigners (from Europe and Asia) seem to have escaped the brunt of the violence, but it’s still probably a good idea to lay low. Some of the victims have been actually burned alive while a mob watches, and that is pretty horrifying. It’s reminiscent of necklacing, a tactic used during the struggle against apartheid to punish “snitches” and still used in other places (including the slums of Brazil). It’s a brutal form of violence and one that is especially shocking from a democracy like South Africa. Especially in a time of what should be peace. I guess the motivation behind the violence is that the township residents accuse the Zimbabwean immigrants of “stealing their jobs”, much the way that xenophobic sentiment in North America (specifically the US) is focused on illegal immigration from Mexico. The South African government and many other notable figures (including Bishop Desmond Tutu) have condemned the attacks. The government has also said they would try to protect foreigners from this violence. They’re accusing the mobs of not actually being xenophobic, but using this as an opportunity for criminal behaviour. There have been a string of arrests and they’re on the verge of deploying the army. They’ve already called in reserve police and brought in reinforcements from other regions to help combat the violence, but I think it’s about time martial law was declared. In a situation like this, good people could easily get swept up and start doing terrible things, so it’s important to nip the situation in the bud. It would be much, much different if the mobs were protesting, or even if they were just destroying property. Then maybe we could tolerate it for a little longer. But cruising around already poor neighbourhoods and murdering people is unacceptable.